Lake Minnetonka Association: Who Chould Pay for Milfoil Control? Who Chould Pay for Milfoil Control? Milfoil is a big problem. That is why the Lake Minnetonka Association and the Lake Minnetonka Conservation District have been preparing a vegetation management plan for three of the worst milfoil bays on Lake Minnetonka (Carmen’s, Gray’s and Phelp’s). We now know two important things: 1) the proposed bay-wide herbicide treatments are expected to control milfoil and curlyleaf pondweed (another exotic plant) and 2) the costs for these treatments. We have received strong support for the proposed treatments. However, the costs are significant and serious questions of who pays for these treatments have been raised. Who should pay for these treatments – both in the short-term and in the long-term? A proposed five-year treatment program is estimated to cost up to $190,000 (Carmen’s), $259,000 (Gray’s) and $247,000 (Phelp’s). We have a good feeling for the costs the first year, but subsequent years’ treatment costs depend on the results from the prior years, so our estimates are probably high for the five-year program. For this reason, our discussions have focused on the costs for the first year. In the long run, if this program is sustained, I expect the annual costs to be about one fifth of the first year costs to maintain essentially milfoil-free bays. So, here I focus on the first year (2008) as that is the most significant hurdle to overcome. The estimated costs for the proposed treatments in 2008 are: $53,000 (Carmen’s), $75,000 (Gray’s) and $71,000 (Phelp’s). The good news is we will apply for and hope to receive grants from the DNR that will reduce the local costs by $10,000 to $15,000 (depending on bay size). The LMCD has committed $5,000 per bay. So, the remaining costs will be: $33,000 (Carmen’s), $60,000 (Gray’s) and $51,000 (Phelp’s). With the anticipated state (DNR) grants, plus the LMCD contribution, the lakeshore owners will be asked to contribute between 62 and 80% of the project costs for 2008 – these percentages would go up in future years if the DNR or LMCD funding are dropped. This is wrong. The DNR funds come from a boat license surcharge for every boat in Minnesota. So these funds are to a degree tied to the movement of milfoil (by boats). The state then re-distributes this money through grants for milfoil treatments, such as are proposed here. However, there is no assurance Lake Minnetonka projects will receive these funds, as the grants are competitive. At the local level, we have argued, as have many lakeshore owners in the three bays, that at a minimum the LMCD should contribute at least the amount of money that would be spent on harvesting because there will be not harvesting in these bays if the treatments occur. I have estimated this to be $31,000 based on the harvesting program’s record averaging 30% in the three bays and an annual budget of $105,000. Simply, it is wrong to ask the lakeshore owners in these bays to both pay a disproportionate share and continue paying for the harvesting (with public funds) which will now occur in other bays. In addition, the LMCD contribution comes from their Save-the-Lake Fund, a fund with a $265,000 balance that has been raised from private contributions and is not public money. As a side note, it is also time to re-evaluate the harvesting program in light of more advanced milfoil controls, such as are being proposed. Indeed, only 16% of survey respondents in this program thought the harvesting program was effective and 76% thought it is short-term, small-scale or ineffective. Science has moved past harvesting as a more effective long-term remedy for milfoil and other invasive plants in Lake Minnetonka. 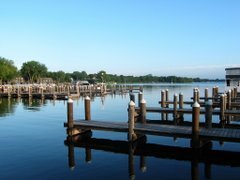 Lake Minnetonka is a public resource for all to use and enjoy. I believe the lakeshore owners have a responsibility to make investments in keeping it clean and healthy; but I also believe our public agencies also have that responsibility. As it stands, there is an imbalance. The window of opportunity for implementing this milfoil control project in 2008 is small, as the treatments would have to occur by early-May. I will be asking the lakeshore owners to support this project with funding as noted above, but their support is entirely voluntary. Regardless of what they choose, this level of private support is neither appropriate nor sustainable in the long run. For the sake of keeping Lake Minnetonka clean and healthy, I think the local communities, through the cities and LMCD, must also step up.